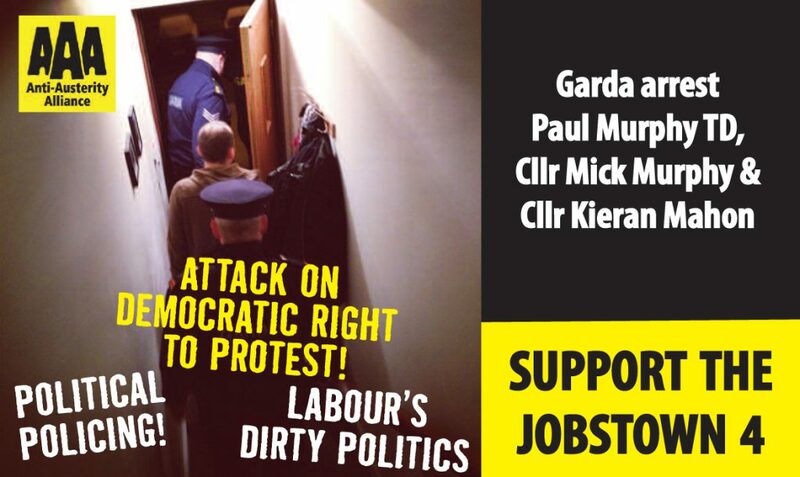 “The arrests of AAA TD Paul Murphy, councillors Kieran Mahon and Mick Murphy and a fourth person who remains to be identified to us as we go to press is a cheap attempt to denigrate and weaken water charges movement as we approach make or break time – bills coming out and need for mass non-payment. “This is the product of a ‘criminal’ investigation involving six Gardai and an ‘incident room’ in Tallaght since November. 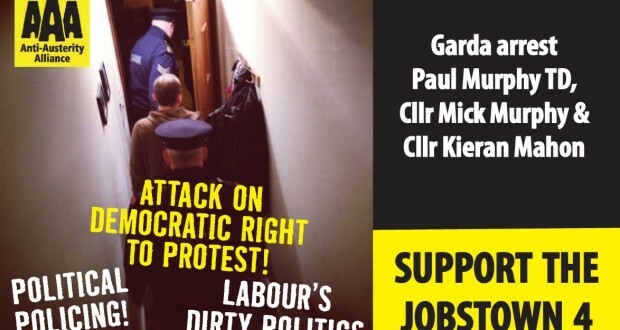 Numerous local people and activists have been interviewed over that time during which the investigating Gardaí have constantly enquired about Paul Murphy’s connection with the events of 15th November. Ordinary people in Tallaght and everywhere else will see this as way over the top and a disgraceful and criminal waste of Garda time and resources. “Where is this investigation coming from? 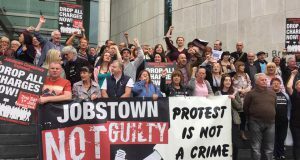 Direct orders from the Government via the Department of Justice may or may not be the case but it is more likely that the Garda have decided to exaggerate and trump up the events of November 15 last year to help the government who are on the back foot on the water charges. 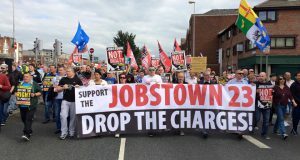 “On November 15 a small protest in Jobstown was swelled spontaneously when word went round that Tanaiste Joan Burton was in the area. This resulted in the delaying of the Tanaiste for a couple of hours as people made clear to her their opposition to water charges and her attacks on the community as Minister for Social Welfare. 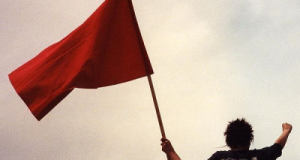 “This was a strong but peaceful protest. The AAA people arrested today did not organise the protest but participated in it and helped ensure that the community could make their point but also that it remained peaceful. It is ironic that on the day, at the time, on the ground, the local police recognised the role that they played and even thanked Paul Murphy!